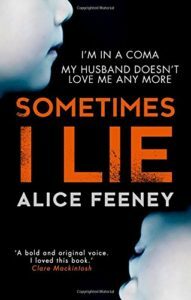 Sometimes I Lie by Alice Feeney is a contemporary psychological thriller which once I started I just could not put down. The book is broken into three different time periods – ‘before’ in 1991, ‘then’ and a week later ‘now.’ The action alternates between them and the reader finds them self trying to join the dots. What happened? What is the truth? Who can you trust? Just some of the questions that ran through my head as I read. All was revealed by the end of the book but I failed miserably in joining the dots correctly. 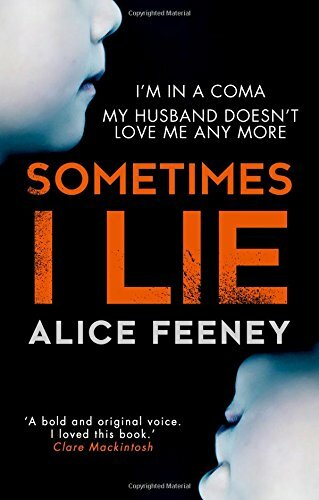 Sometimes I Lie was a compulsive read. The action was well paced, unlike my heart, whose beats sped up the more I read. The characters were a blend of menacing, suspicious and innocence, completely throwing me as to who the villain was. Are we all a mixture of innocence and experience? The novel was about family and love. A distorted view at times with the pressures of living closely together, the sibling rivalry and the pressure of parents. And the unending loyalty. Sometimes I Lie is more than a little disturbing at times. It messes with your mind. It has a cleverly constructed plot that has been extremely well thought out. It is a marvellous read. It is a book you will not want to put down and you certainly do not want to miss.